After spending numerous hours on the ground floor of Hillman Library preparing for exams last week, Pitt junior psychology and chemistry major Geena Richards saw students getting turned away at the door by a new security guard. That’s when she remembered what her friends had told her the day before — all hot food was banned from Hillman Library. “I was there a few day ago, and there was a security guard there from about 3-5 p.m. stopping students if they had any food bags,” Richards said. In the past, most students have brought in whatever food they had wanted to the library. Hillman Library’s policy on bringing in hot food from outside has been in place for years, but it was not until recently that Pitt began enforcing it. While Hillman’s website did not specify if the food brought in could be hot or cold, it did say that students could only eat at Cup and Chaucer. “We really hadn’t been enforcing that policy, and foods of all sorts — and I do mean all — have been consumed in the library over the last several years,” Wisniewski said. The library first began to more strictly enforce the policy via an April 12 Facebook post reminding students not to bring hot food anywhere into the building. The policy allows for students to bring cold foods as long as they are consumed in the vicinity of Cup and Chaucer. All drinks may still be consumed on any floor of the library as long as the containers are covered when not in use. The post included pictures of what foods are permitted in the building from now on, such as coffee, sandwiches and fruit, as well as what is no longer allowed, which includes burgers, pizza and fast-food dishes. “We want to keep the library clean, comfortable, and free of overpowering olfactory experiences. Luckily, Schenley Park is right across the street for all your hot-food-consumption-requirements,” ULS at Pitt posted. The post was met with angry reactions from students, including “Schenley Park? It’s 36 degrees and blizzarding,” and criticism on why the enforcement suddenly changed. 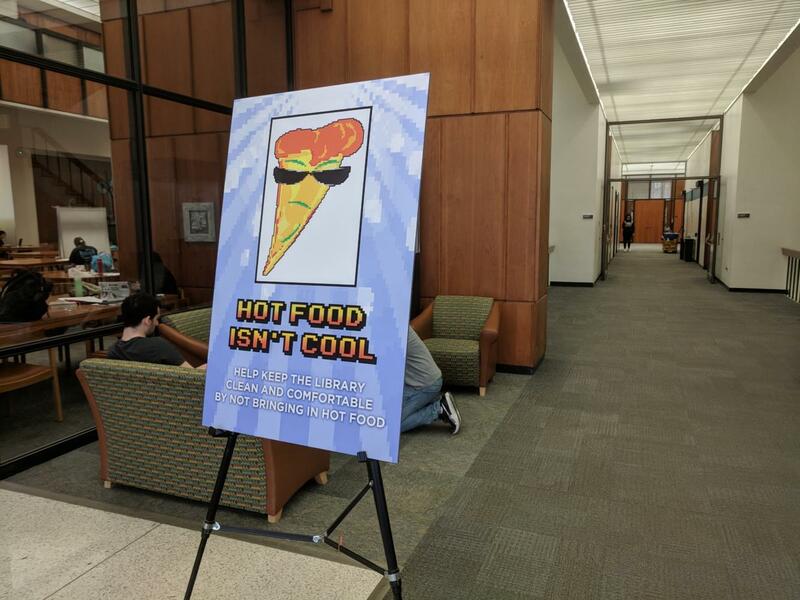 In addition to the post, a sign showing a sunglasses-wearing slice of pizza with the words “HOT FOOD ISN’T COOL” printed beneath has been set up in the ground floor of Hillman. A reminder from the library is also written on the sign, telling students to not bring hot foods into the building to keep the library clean and comfortable. Students have turned the sign into a meme poking fun at the design of the poster. The satire publication The Black Sheep posted an article, titled “Analyzing Hillman’s ‘No Hot Food’ Propaganda,” in which it examines the sign, which is placed at most tables. The resulting #FreeTheSlice movement has not picked up much momentum, but a few posts can be found on Twitter. Students who regularly brought food to eat while studying have spoken out online after learning about the new change in policy. Most students were unaware that this has been the policy in Hillman for more than a decade. The library staff said they have gotten both positive and negative feedback about the enforcement of the policy from students. Many students haven’t accepted the change in enforcement and have created petitions online to try to change the policy. Some students said they will keep bringing in their food, regardless of if they can or not. “It’s only specific people that take it too far, but people sneak [food] in all the time,” Richards said.